The Gowanus Lounge: Hey, Are We in Staten Island or Brooklyn? Hey, Are We in Staten Island or Brooklyn? One of the things Gowanus Lounge loves about strolling around are the snippets of conversation you can pick up, at least, when you're not wearing your iThing. 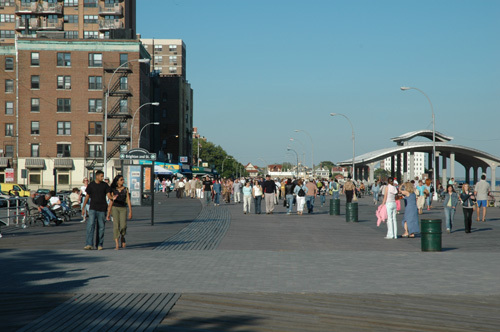 And so, we were walking on the boardwalk, just past the dividing line between Coney Island and Brighton Beach. It was right around the spot where you expect Leonid Brezhnev and Konstantin Chernenko and Yuri Andropov to come strolling arm and arm down the boardwalk decked out in Soviet Chic. We passed by a guy and his girlfriend, who were clearly not Coney Islanders or Brighton Beachers, walking on the boardwalk. Female: So, are we, like, in Brooklyn or Staten Island? GL has absolutely nothing to add to that. How About a Summer Pad in...Seagate?